Sony Pictures Animation routinely amazes me with the entertainment value the company is able to put together with much smaller budgets than other animated movies are given. The company’s recent endeavor, Cloudy With A Chance Of Meatballs 2, was actually created on a smaller budget than its animated precursor, but it still manages to have a cute premise coupled with fun and sometimes even dazzling imagery. Soon, you’ll be able to catch it from the comfort of your own home. Sony Pictures Home Entertainment is bringing the film onto Blu-ray 3D, Blu-ray and DVD on January 28. The second food-based film picks up right where the first film left off and features the same likeable characters, including the young inventor Flint, weather woman Sam, and more. This time the crew infiltrates a jungle-covered island, which has been populated by a bunch of foodimals, a few of which are pictured on the cover above. The adventure is to recapture the FLDSMDFR machine that kicked off the franchise, but there are a few twists and curves along the way. 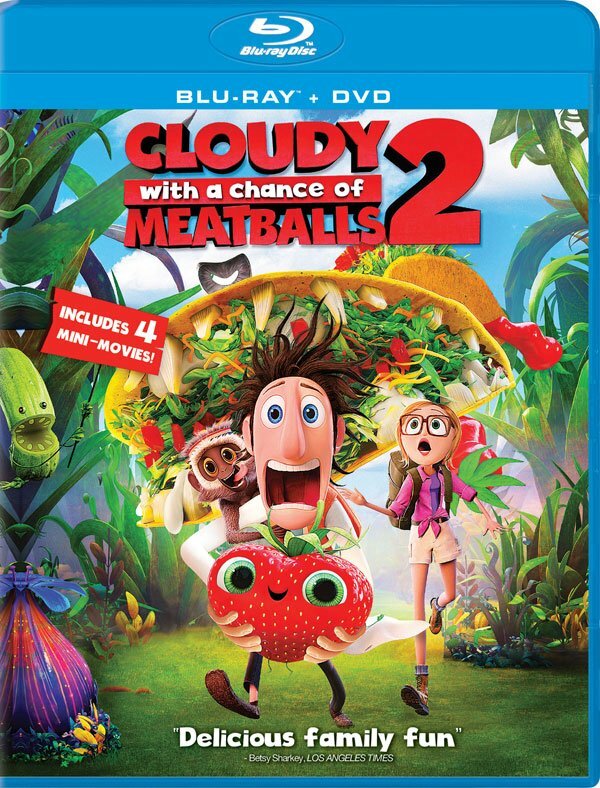 Animated movies often come with a bunch of bonus features, but Cloudy with a Chance of Meatballs 2 goes above and beyond. Audiences who spring for Blu-ray and Blu-ray 3D copies will get four short movies with the set, as well as deleted scenes. If you are more into behind-the-scenes extras, the DVD could still be a fine choice. Blu-ray 3D, Blu-ray, and DVD copies will all come looks at the animation, the end credits of the film and much, much more. You can pre-order the set over at Amazon, or check out the full list of credits, below. "Attack of the 50-Foot Gummi Bear" – Flint’s mischievous gummi bear grows to 50-feet by using his new food-modifying invention while Steve is in charge. Steve must frantically chase the gummi bear and transform him back to normal size before Flint returns to the lab. "Steve’s First Bath" - Flint’s failed date with Sam is because of Steve’s mischievous ways. "Super Manny" - Manny, the Jack of all trades, saves an adorable kitty with his many skills. "Earl Scouts" – The Foodimals join Earl's scouting program but are very competitive. "Anatomy of a Foodimal" - Flamangos, Cheesespiders, Hippotatomuses! Oh my! Sit down with filmmakers to discuss the inspiration behind these wacky food-animal hybrids that have taken over Swallow Falls, and chat with the gang to find out how they came up with the Foodimal's creative and amusing names. "Production Design: Back in the Kitchen" - Where do you go after it rains cheeseburgers all over Swallow Falls? Back to the kitchen of course! Hear from filmmakers Cody Cameron and Kris Pearn on how they came up with stories and jokes for the film. "Awesome End Credits" - Dive into the end credit sequence with the filmmakers and discover how they used a mix of 3D, 2D, stop motion and live action. "Cloudy Café: Who’s On the Menu?" – Hear from newcomers Will Forte and Kristen Schaal about what drew them (pun intended) to this animated feature and how they "discovered" the voices of Chester V and Barb. Then, sit down with Terry Crews, as he steps into the pair of size 12 shoes left by Mr. T to portray Officer Earl Devereaux. Plus, hear from all your returning favorites including Anna Ferris and Bill Hader. "Building the Foodimals" - Animators discuss creating and animating the foodimals. "The Sasquash "- Exploring all the places in the film that the sneaky Sasquash is hiding.